Here comes round two of our favorite dessert recipe – Low Carb Chocolate Cheesecake! 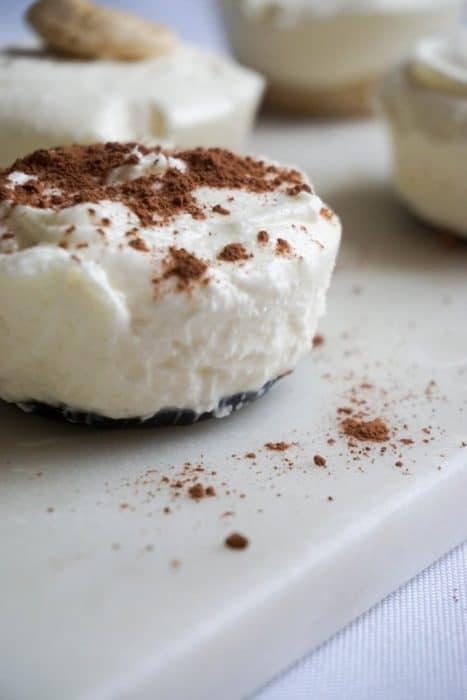 For those of you who aren’t fans of cashews(our first installment of these cheesecakes) or who love chocolate more we’ve created the ultimate low carb, keto-friendly dessert, and no baking is required! I dedicated the first cheesecake recipe – Cashew Cheesecake – to my mom so this one goes out to the second leading lady in my life, Miley, our cat! Now, since she is a cat she can’t actually try the cheesecake and give a word play of what it tastes like so I am going to describe as she would. If Miley were a dessert she would be this chocolate cheesecake. Just like this cheesecake she has two layers, one really soft and sweet, and one hard and slightly bitter. The ratio of this cheesecake, 95% soft and sweet, also resembles Miley’s personality to a tee. You’ll love her to death on most days, but once every blue moon she’ll show you her “I’m hard and in charge” side. Just like myself, Miley loves how easy these cheesecakes are to make, but mostly how easy they are to eat! Like mother, like daughter. With the added bonus of not having to bake these anyone is capable of making them perfect every time. Compared to the cashew crust, this one has a harder bite to it and it’s also richer in flavor. The cocoa powder really comes through with the simple sweetness of the cheesecake filling! 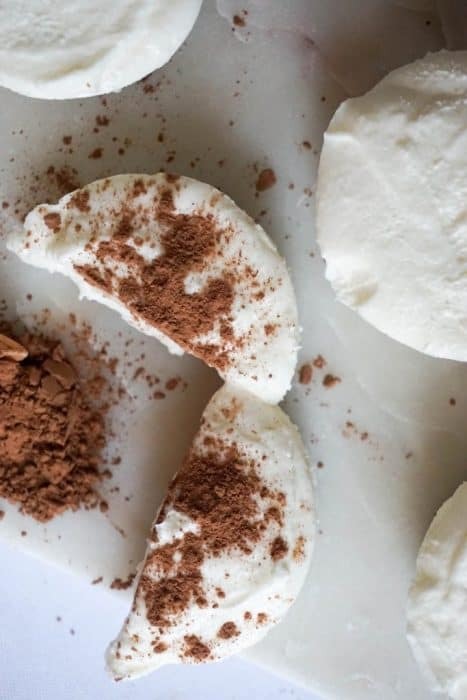 This recipe would be labeled as a sugar free dessert based on the substitute sweetener we used, and we used Miley’s favorite – erythritol based on its 1 glycemic index! Erythritol gives the filling a nice gritty bite to it. However, if you’re not a fan of erythritol or being able to taste each piece of granular sugar, you can use Swerve confectioner sugar which will blend well and go unnoticed! All of the cheesecakes we made for you will last in the fridge up to ten days and if you’re making them for a party we recommend making them the night before so they have enough time to set! 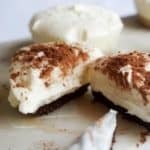 Check out some of our other awesome keto desserts! We’d recommend our triple chocolate muffins or these Pumpkin Cheesecake Cupcakes! Combine melted butter, almond meal, coco powder and stevia. Cream together cream cheese, sour cream, heavy whipping cream and erythritol. Take cold crusts out of freezer and, keeping the crust still in the muffin cups, dollop filling on top of crust evenly. Place in fridge for 2-3 hours or freezer for 1-2 hours. Dust with cocoa powder(optional).